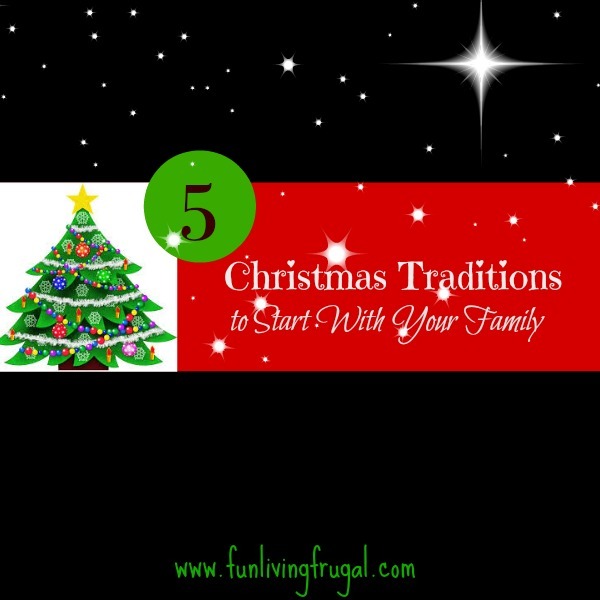 5 Christmas Traditions to Start With Your Family! 1. Pajama Night: My children and I love Pajama Night when we all grab our favorite pj’s and settle in for a fun night of Christmas movies. It is our tradition to gather all the pillows in the house and lay them in the living room floor and get comfy for the annual viewing of ELF! This tradition is so near to my children’s hearts that they won’t want this particular movie all year long until Pajama Night arrives. Throw on your pajamas and gather your family together to watch your favorite Christmas classics! 2. Thrift Shop Treasure: Find a local thrift shop and take the family to pick out that one of a kind treasure to give to a family member or friend. Kids love browsing through thrift stores where everything is unique and they always find something their gift reciepient would never expect to receive. These gifts are really given from the heart because kids tend to take this task seriously when thinking about what gift would be perfect to give. I love seeing the look on my kids faces as they take this gift home to wrap and put under the tree! 3. Baking Memories: One of the yummiest Christmas traditions for my family is making old fashioned cookies and candies to give out to neighbors, family, and friends. Like us, you may have traditional family recipes that get pulled out every holiday. If not, there is the great world of Pinterest to find some amazing treats that could become your traditional holiday favorites. The possibilities are endless. Sugar cookies are great because you can cut out all sorts of holiday shapes and decorate any way you please. Just remember when younger kids are involved with this activity the process may get a little messy. Don’t worry thought, it is the time spend with them and seeing their excitement during this project that will make a lasting memory. 4. Giving to Charity: This is probably one of the most important traditions for our family. During the holidays you can find many different charities to give to. The Salvation Army has their red kettle drive and bell ringers are set up all around the city where you can drop your change in the donation bucket. I always make sure I have extra change in my purse this time of year just for this purpose as well as making sure my kids have a few coins in their pocket for giving. It’s amazing how proud children can feel just when giving a few cents. This tradition also helps a child start on their path to giving from the heart. Believe me when I say the spirit of giving will follow them throughout their life when they start early. The Angel Tree is another thing you will see in malls and stores throughout the holiday season. You can pick an angel to shop for according to their wish list and return the gift to the given location. It can be fun for your child to pick an angel that is similar in age to themselves. There is always fun when shopping for this special child. We also like to pray over our angel throughout holiday season. Sometimes you may not have the extra funds to buy gifts for an angel because you are struggling yourself. This has happened to us before when my husband or I were out of work but we still wanted our children to have the gift of giving. This is when we would pick out an inexpensive gift and drop it off at a local toy drive. Personally we bought a few games of Candy Land when on sale for $3! If you plan ahead you can even pick up toys for up to 75% off all throughout the year. Don’t miss out on the spirit of giving even if it is something little. For the reciepient it can be a big thing! 5. Christmas Lights: The reason I really love the tradition of driving to see Christmas lights is because it is a really frugal activity and the kids love it! Do you have that one house in the neighborhood who goes all out on their Christmas light display? We do and it is a must see every year! A great idea is to wrap up a small inexpensive gift for your child and allow them to open it during your drive to see the lights. We like to pack a festive basket of goodies and a thermos of hot chocolate when we go. Just a little tip we like to use…. I purchase the Styrofoam coffee cups at the dollar store with the lids. It’s like Starbucks but well, you know, much cheaper! There are literally a ton of Christmas tradition ideas on the internet. I’ve had fun sharing some of our family favorites with you, but no matter what traditions you begin, just know they will hold a lifetime of memories for your family. Previous postBulu Box ~ Healthier Products Shipped Right to Your Door 1/2 Off 3 Month Subscription! Next postCave Tools Digital Cooking Thermometer Review ~ A Must Have For Holiday Cooking!